Next Meeting: Meetings are always held on the second Tuesday of each month at 1900 in the Gray Community Center, 107 Gray Ruritan Drive, in Gray, TN. ( The Gray Community Center is next to the Gray Volunteer Fire Department). Our next regularly scheduled meeting will be held May 14, 2019 at Black Olive Restaurant, Jonesborough. ATTN: Most of the pictures on the website have been turned into "thumbnails". When you click on them, the picture will enlarge. This has been done to improve the "connect time" to the graphics page, particularly those with dial-up modem access. Those pages should now load faster. Fundraising: Successful Fundraiser at JBO Lowe’s. $454.00. Keith Thompson made the motion, seconded by Tom Pauls, that we have our 15 JUN 19 Hotdog Fundraiser at Kingsport Lowe’s. Motion carried. Recruiting and Retention: Ann Larson volunteered to put together an updated recruiting handout. Unfinished Business: Community Service Awards are being prepared and presenters assigned. New Business: Brian Maupin made the motion, seconded by Tom Pauls, that we place a ½ page ad in the Department Convention Program. 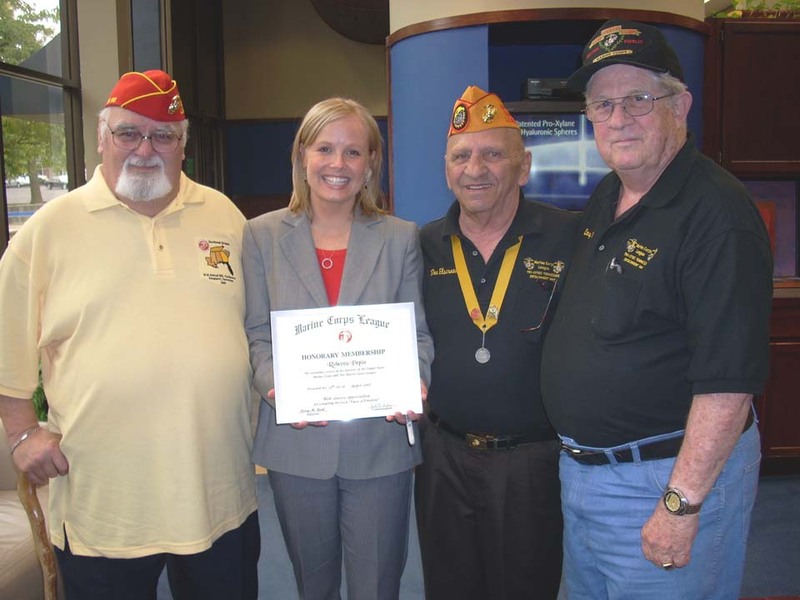 Ann Larson made the motion, seconded by Brian Maupin, that we donate $500,00 to VAVS and $500.00 to Tri Cities Military Advisory Council. Motion Carried. Detachment Elections were held. Motion by Jack Larkey, seconded by Ann Larson, to accept by acclimation the following Detachment Officers: Commandant - Doug Essinger, Sr Vice - Dave Wolgast, Jr Vice – Leon Cox, Judge Advocate – Brian Maupin. Appointed Officers are Paymaster – Jack Larkey, Adjutant – Tom Pardue, Chaplain – Ann Larson, Sgt at Arms – Riley Newcomb and VAVS – Keith Thompson. Motion carried. Tom Pardue made arrangements with Black Olive in Jonesborough for our Installation Dinner on 14 MAY 19 at 1830. Membership Info: Presently our members are being asked to volunteer personal information to Marine Brian Maupin in regard to setting up a confidential #969 member data base. On the back of the form you could include that information about yourself that you would like to be published on our Detachment Web Site under Members. Online Detachment Newsletter: The detachment newsletter is being posted online. We would like to reduce the number of newsletters, and associated costs, to send via snail mail. Please take the time to access the online newsletter for your review. Select the month you want to review and click on GO. If you have any comments or suggestions, please advise the web sergeant. NOTE: The Newsletters are posted in .pdf format. (For info, .pdf stands for Portable Document Format) To view, it requires Adobe Reader. If you don't have Adobe Reader, go to http://www.adobe.com/products/acrobat/readstep2.html to download and install the program. AGSM’s Campaign for Fisher House will help fund the building of a Fisher House at Dover Air Force Base in Delaware. This special house will be used by families attending the Dignified Transfer of Remains Ceremonies as their fallen loved ones are returned to American soil. Thanks to the assistance of the American Gold Star Mothers, families of our American Heroes will be able to stay at a Fisher House for this solemn occasion. Veterans - Need a job? The federal workforce is facing a potential crisis. Thousands of federal employees will retire, leaving a massive whole in the federal government. In fact, a Partnership for a Public Service projects that the federal government needs to hire nearly 193,000 new workers for jobs in these fields: security, medical and public health, accounting, engineering, and program management/analysis and administration. Go to: http://www.military.com/careers to apply. FOOD BANK The Gray Community Center (where the detachment meets monthly) maintains a food bank for needy families. Please consider donating some non-perishable food items to re-stock the Food Bank by bringing them to our next regularly scheduled meeting. This action helps to “pay” the community for allowing the detachment to use the Gray Community Center. USMC Support of Marine Funerals Family members of deceased Marines can request military honors for a funeral through the following Headquarters Marine Corps hotline: (866) 826-3628. Do not call Marine Reserve Centers directly! 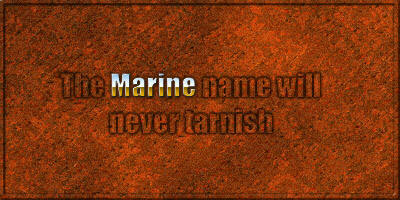 They cannot provide honors without direction from Headquarters Marine Corps. Information about VA Health Care Program. "...they represent the true strength of the country and the heart and soul of its citizens." Today more than 174,000 active duty and 37,000 reserve Marines protect the United States of America, bravely serving our nation in hotbeds of violence like Iraq and Afghanistan. Their dedication often has a price. Department of Defense statistics indicate 1,854 Marines were wounded in Operation Iraqi Freedom from March 19, 2003 through September 4, 2004. While the Marine Corps goes above and beyond to support Marines and their families, there are limits to the amount of funding available. The Injured Marine Semper Fi Fund was formed to provide supplemental assistance to our Marines, sailors, and their families as they face their road to recovery. 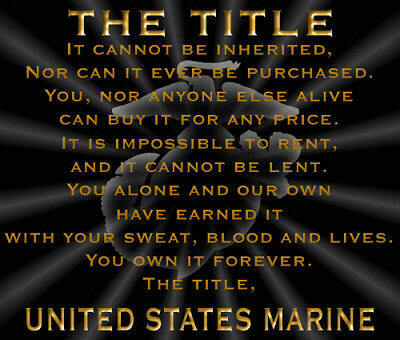 Please make checks payable to the Injured Marine Semper Fi Fund. Military Personnel Records: Do you need a copy of your Military Personnel Records? Go HERE to obtain them. RAPIDS: Need an ID card for Family Member? (Active duty and Retired Marines) Go HERE to determine closest location you will need to coordinate with. KIA Memorial Quilt: Bill Weiler provided a link to a web page that may be of interest to the detachment, possibly as a memorial to Sgt. Speer. Please check it out by going HERE. Marine For Life Program. For those Marines that are planning to separate from active duty in the Marine Corps, be sure to check out this program. It will provide assistance in returning to civilian life, including employment. There is a link to this valuable program on the first page of this website. 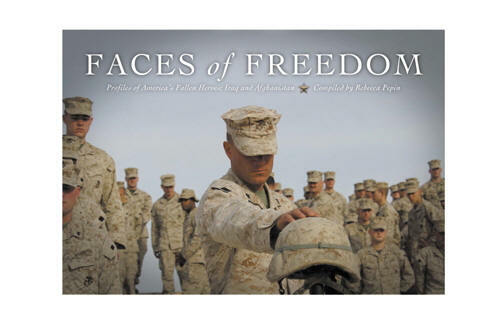 This book profiles fallen heroes who lost their lives in Iraq or Afghanistan. It includes one service member from each of the 50 states along with D.C. and Puerto Rico. All branches of the military are represented. Go to: http://www.wentworthprinting.com/facesoffreedom/ to purchase. MCL/MCLA and/or family members Don ELSEROAD, Bobby STEWART, Ed GUCKERT, John HICKS, Michael STEWART, Gary CAMPBELL, June BEVIL, Ann LARSON, Larry LARSON are having or have recently had various health problems. Please keep all of these folks and their families in your thoughts and prayers. Please advise Web Sergeant of any detachment members whose names should appear under this item. Membership Renewals: Send checks to MCL 969 Paymaster Jack W. Larkey, 2413 Steward Street. Johnson City, TN. 37601 Tel # 423-282-4905. Note: If there are any files on this website that are subject to copyright infringement, please advise web sergeant so they can be properly examined.